Stunning artwork isn't limited to hanging on the wall or being displayed in a gallery. Here in our greeting cards section, we offer a large assortment of stunning pieces that are perfect for owning or gifting, and more than that, they're a great way to celebrate and carry your favorite artwork with you! Here in this section, you will find smaller displays of artwork that are every bit as appealing as their full-sized prints! 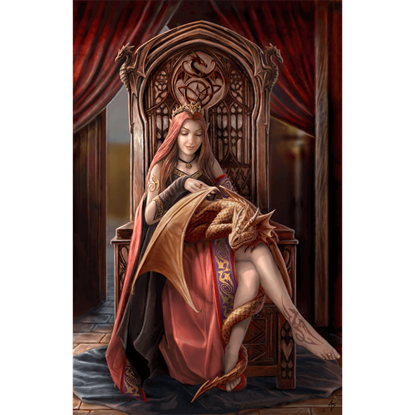 This section is a bit more broad in its scope, featuring all of our greeting cards that show off any sort of beautiful artwork, whether it is from fantasy or history, modern or antique. 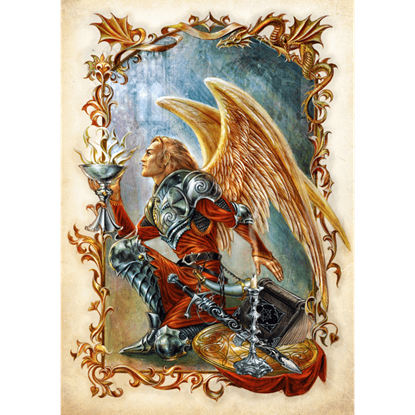 Thus, you might find greeting cards with the designs of da Vinci on them just as you might find holiday cards with the works of Anne Stokes! So if you're looking for some stunning art that is easy to carry and great to gift, then our Greeting Cards and Bookmarks section will deliver all that and more. 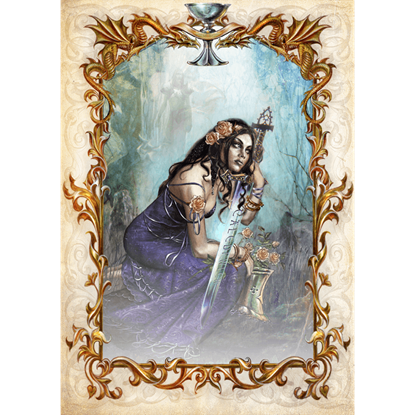 Loosely based on the legends that surround King Arthur, these Angelic Grail Quest Cards by Briar embody the perfect blend of medieval style and myth, creating an accent and a gift that any enthusiast is sure to enjoy when received. Present your loved one with a beautiful illustration of hope when you send a greeting card from Blessing Cards 6 Pack. 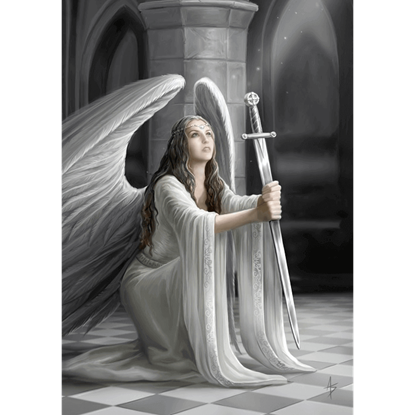 These six identical cards feature gorgeous Anne Stokes artwork depicting a fervent angel maiden holding a sword. Under the light of a blue moon, the enchanted forest awakens its magic. The beautiful maiden and her unicorn friend arise from their slumber. 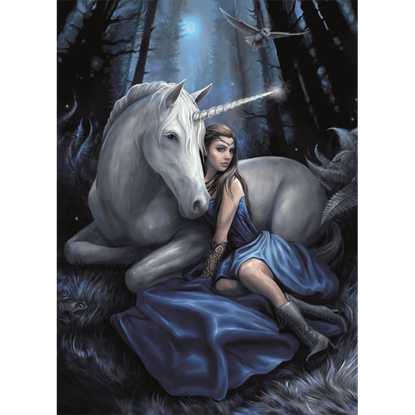 The Blue Moon Cards 6 Pack depicts this fantasy scene from the artwork of Anne Stokes. Within the hidden caverns of the desert, this scorpion-like dragon watches over its young as it awaits nightfall. 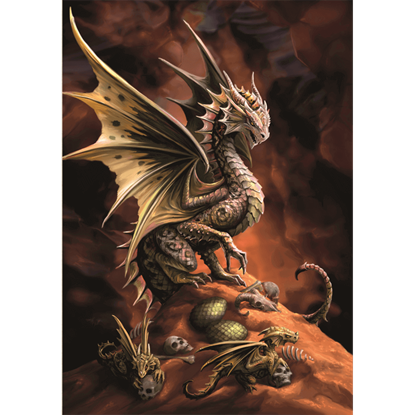 Present your friends and family with this unique fantasy scene when you send a card from the Desert Dragon Cards 6 Pack. One of the best parts of the holiday season are the sweet treats, and this card shows how a fantasy enthusiast makes their best dishes! 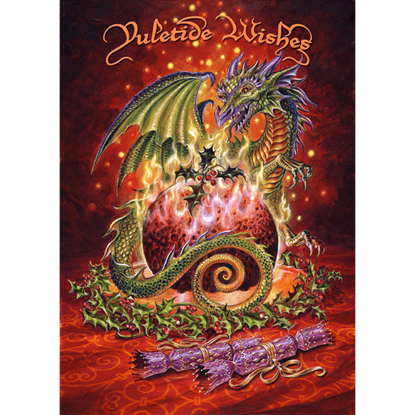 The Dragon Pudding Yule Cards by Briar are perfect for bringing humor and fantasy to your holiday. 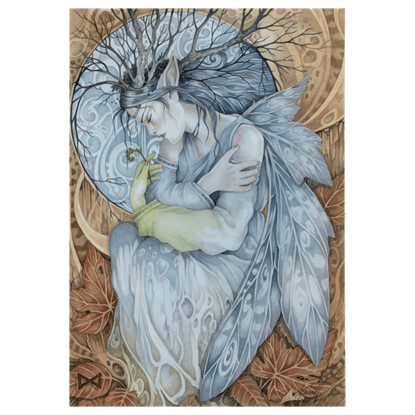 If ever there was a fairy of the seasons, then she is depicted on this Emergence of Spring Card 6 Pack! This set of cards consists of 6 identical cards, each of which features the stunning artwork of noted fantasy artist, Linda Ravenscroft. Nothing gets a message across quite like a fire-breathing dragon. 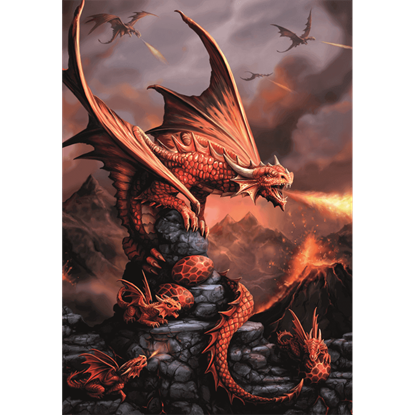 Send friends, family, and fellow dragon fans your thoughts using the Fire Dragon Cards 6 Pack, brimming with fiery fantasy style from the artwork of Anne Stokes. A card is the perfect way to say what you cannot. For those moments, you should choose to send a card that speaks for your personal style. If you love fantasy, there are no better cards to send then these Friends Forever Greeting Cards! Do you ever stop to admire the beauty of nature? Sometimes frost can have the most intricate designs. 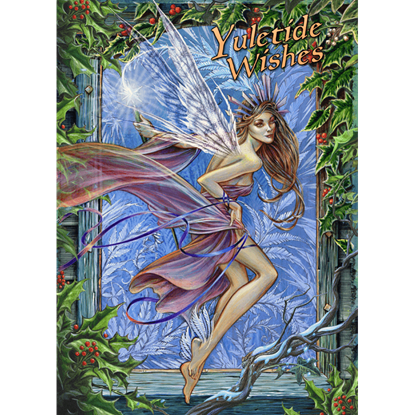 The Frost Fairy Yule Cards by Briar immortalize the beauty of frost with fantasy, depicting the fairy that shapes it with her magic. Loosely based on the legends that surround King Arthur, these Galahad's Prayer Cards by Briar embody the perfect blend of medieval style and myth, creating an accent and a gift that any enthusiast is sure to enjoy when received. Send loved ones a message of courage when you write it in a card from the Inner Strength Cards 6 Pack. 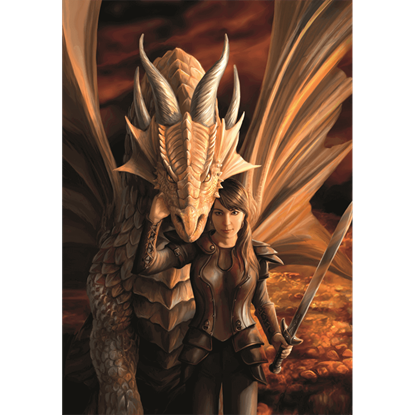 The image on the front of each fantasy greeting card depicts an armored young woman backed by a dragon, her sword in one hand. A card is the perfect way to say what you cannot. For those moments, you should choose to send a card that speaks for your personal style. 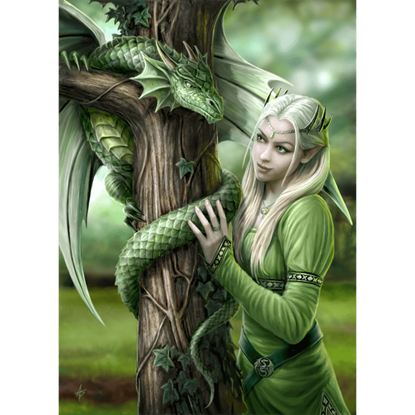 If you love fantasy, there are no better cards to send then these Kindred Spirit Greeting Cards!